This shadow shot was taken back in January. 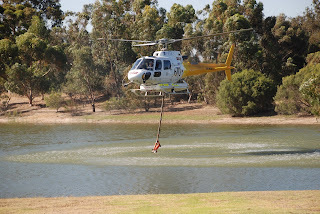 We live in the foothills of Perth and unfortunately have had some very bad fires around in the more bushy areas. 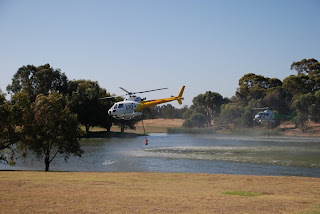 We have a lake across the road from where we live and this lake is utilised by the water bombers that are fighting fires close by. 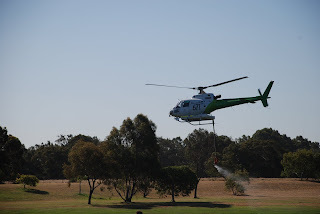 You can see the shadow of the helicopter just behind it as it comes down to fill up with water. 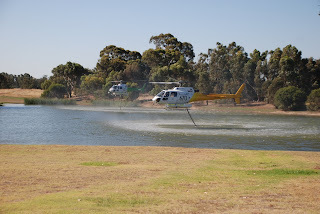 This particular day we had 2 water bombers using the lake as you can see below with some more pics from that day. 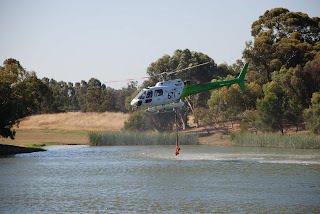 Today, Sunday February 22nd has been declared a National Day of Mourning in respect to the Victoria BushFires that have absolutely devastated so many lives, destroyed communities and killed 1000's of animals and wildlife. The fires that these people were fighting here across the road from my home were tiny compared to the fires in Victoria so if you have a moment today please spend that time in reflection and prayer for those that have lost their lives and also remembering the amazing people who have put their own lives on the line fighting these horrendous fires. Not only shadows but you captured some wonderful action shots! Many prayers for all those affected by this devastation. Great shadow shot! You have fires over there too? Stay safe! I didn't realise it has been declared a National Day of Mourning today, so thanks for letting us know. Unfortunatly these disasters seem to happen more frequently, as we over-populate our planet and build to far into the bush. It happens all over the states too, but the loss of life is tragic in any form. Thoughts and prayers are with you and your countrymen! This is amazing to see and a great tribute to all the fire fighters and to all of you who are coping with the situation. I hope you stay safe.